Kovac was forced to introduce Arjen Robben after Kingsley Coman left the game to injury and, after Robert Lewandowski’s penalty, the Dutchman secured all three points in the 90th minute. Speaking after the match, new manager Kovac praised Hoffenheim for a ‘decent job’ but was overall satisfied to get his team’s bid for a seventh title off to a winning start. ‘It was an entertaining match, and it was a deserved victory, even by this margin. But it wasn’t as clear-cut as the scoreline suggests,’ he said in quotes published on the club’s official website. ‘Hoffenheim did a decent job, especially between the 46th and the 70th minute. We failed to find solutions then. ‘We didn’t play as we had planned in the first half. We didn’t play boldly, we didn’t have enough possession, so we had to chase the ball,’ he said. 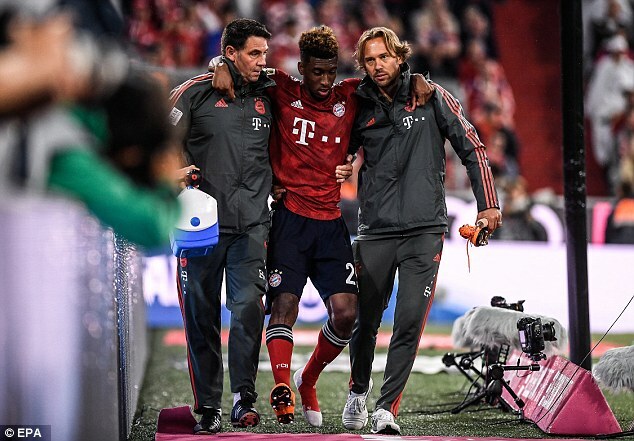 Bayern announced after the game that Coman would be sidelined for ‘a number of weeks’ after suffering an ankle injury.